US demand for alternative sweeteners is forecast to rise nearly 3 percent per year to $1.5 billion in 2020. High intensity sweeteners will account for nearly half of all alternative sweeteners sales in the US , while Ace-K is forecast see strong growth, and sucralose will present modest growth. Natural sweeteners such as stevia and monk fruit will post double digit gains through 2020. Food applications will continue to account for over half of the US market, though beverages will continue to lose share to other applications. 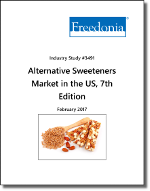 This Freedonia industry study analyzes the $1.3 billion US alternative sweeteners industry, presenting historical data plus forecasts for 2020 by product class, including high intensity sweeteners, polyols, and natural alternative sweeteners. Data is also provided by market segment, including food applications and beverages, pharmaceuticals, and personal care products. The study also evaluates company market share and offers competitive analysis on industry competitors including Roquette America, Ingredion, Tate & Lyle, and Niutang.